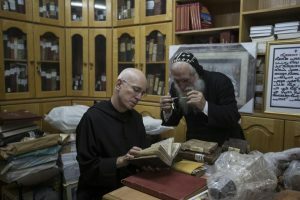 The word “rescue” doesn’t always connect in people’s monks with the life and work of a Benedictine monk, but when you read a recent article in The Atlantic, you will have a new appreciation of the connection. It is a fact that Father Columba Stewart, monk of St. John’s Abbey (Collegeville, MN) spends a great deal of time rescuing some of the world’s precious manuscripts from possible human destruction –think of ISIS– and natural decay in a project sponsored by Saint John’s Abbey and University —Hill Museum & Manuscript Library (HMML). The HMML project puts on microfilm and in digital format manuscripts the world has a rarely seen. This is human project with Divine blessing; a true ecumenical and inter-faith project that reaches into the deep for the sake of something greater: Truth. What else could you expect a monk to do as a fruit of his contemplation? This, for me, is crucial consequence of the Incarnation of the Lord.